Smith Bradbeer are one of the UK’s leading independent home furnishing retailers. Smith Bradbeer required a new warehouse to be located within close proximity to their furniture store at Tollbar Way, Hedge End. 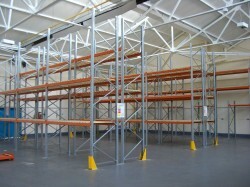 They wished to rack out their new warehouse using space efficient adjustable pallet racking to maximise space & also picking efficiency. 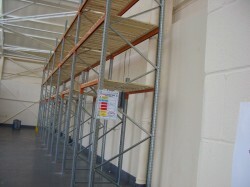 HMF specified a pallet racking system that was easily adjustable for future ease of configuration arrangements. The installation incorporated safety features with column guard protectors & various types of beam profiles. The design had several types of decking to store beds, sofas, occasional furniture & flat packed furniture. HMF used Dexion P90 adjustable pallet racking with open boarded structural decking & high density particle board for storage of carpets complete with heavy duty pallet support bars. HMF provided structural bay load signage to clearly identify the loadings of the various storage equipment utilised throughout the installation. The finish of the pallet racking included pre-galvanised end frames & powder coated beams, all designed to achieve FEM & SEMA standards. The installation was completed on programme by HMF within a 2 week period.